The Rhino speed hump can be easily set up or moved. THE regular speed hump has been around for ages, but they are permanent and noisy. Common speed hump problems include, for example, one hump being ineffective because it is in the wrong place and humps being located near an outside coffee shop where patrons are subjected to noisy tyre and suspension thumps, excessive exhaust smells and squeaky brakes from cars slowing and then accelerating. Little else can be done to remedy these problems – except to dig the hump out and start again. Finally the concept has been refined. Available from Australian Warehouse Solutions (AWS) , Rhino Speed Humps are an innovative and cost effective speed deterrent that is easy to install, less noisy and can be re-located in less than half an hour. Rhino Speed Humps are manufactured from tough recycled thermoplastic, and can be installed in twenty minutes with a reasonable power drill. The speed hump's composition means it produces less noise from the bump-thump of vehicle suspension systems and tyres. 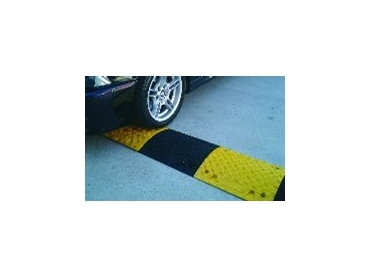 It is also made in 500mm modules so the speed hump can be tailor-made for any situation. The Rhino Speed Hump also has aesthetic appeal. The Rhino Speed Hump can be easily unbolted and moved.